For many learners, school fees are a barrier to education. For more than a year, students around the country have put high university fees under the spotlight. But it's not only at university that fees are an issue: the cost of school education is also a barrier for many. Unlike higher education, the right to basic education in Section 29 of the Constitution is immediately realisable. This means that education of an adequate quality must be accessible to everyone, immediately. Moreover, the Constitution requires that historical imbalances in education funding and provision be removed. In response to unequal access to quality public schooling, the South African Schools Act was amended in 2005 to establish a quintile system. Under this system, schools are categorised into 5 groups (quintiles) based on the relative wealth of their surrounding communities. Schools in the poorest communities are classified as Quintile 1 and schools serving the wealthiest communities are classified as Quintile 5. Quintile 1, 2 and 3 schools are not allowed to charge fees and are often referred to as no-fee schools. These schools are entitled to receive a minimum amount of funding per learner (outside staff costs) that is known as the "no fee threshold". In 2016, this was set at R1,175 per learner per year. Quintile 1, 2 and 3 schools must receive funding from Provincial Education Departments at this minimum amount, while Quintile 4 schools must receive at least R588 per learner and Quintile 5 schools must receive at least R203 per learner. The development of no-fee school policies has resulted in an increase in learners who do not pay school fees, from just 3% in 2006 to 65% in 2014 (StatsSA, 2014). Provincially, 92% of learners in Limpopo and 82% of learners in the Eastern Cape attended no fee schools in 2014 while 41% of learners in the Western Cape and 45% of learners in Gauteng paid no school fees. The South African Schools Act allows learners to apply for a fee exemption if they have been accepted into a fee-charging public school and cannot afford the fees. The Regulations Relating to the Exemption of Parents from Payment of School Fees in Public Schools sets out the procedures that must be followed by parents and school governing bodies (SGBs). Learners' parents are entitled to full exemption if school fees account for more than 10% of their combined annual gross income. The regulations further exempt certain children automatically from paying school fees, including orphans in orphanages and child-headed households, learners whose parents receive a social grant on their behalf such as the Child Support Grant, and learners in the care of foster parents. However, fee-charging schools have an interest in admitting fee-paying learners and may not make the right decisions about whether to admit poorer learners and approve fee exemptions. The Equal Education Law Centre deals with such cases on a regular basis and has undertaken litigation on behalf of single parents to challenge aspects of the process. Also, while section 40(2) of the Act entitles parents who have been denied fee exemptions to appeal the SGB's decision to the head of department, the procedure for doing so is rarely clear or indeed communicated to affected parents. In 2014, only 7% of learners benefitted from fee reductions, exemptions or partial bursaries (StatsSA, General Household Survey, 2015). In spite of increased access to no-fee schools, school fees (and other schooling costs) are still a barrier to learner enrolment and contribute to the high drop-out rate. The General Household Survey found that 24% of people aged 7 to 18 cited "no money for school fees" as the main reason for not attending an education institution in 2014. 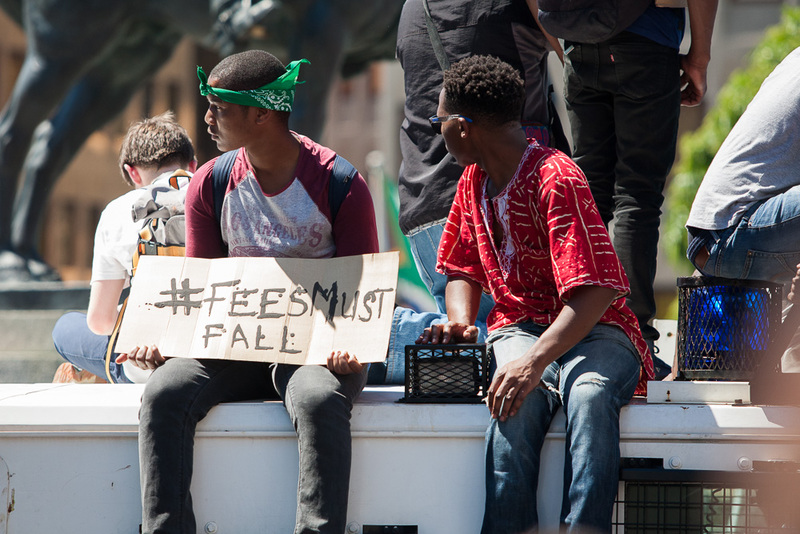 Are fees compatible with equalising access to quality education? Education researcher Nic Spaull has referred to basic education in South Africa as a "two-tier" system. The first tier includes fee-charging public schools and high-fee private schools, which are well-resourced schools with high quality facilities, teachers and high exam pass rates. In the second tier are no-fee public schools and low-fee private schools, which are under-resourced, with poor facilities, under-qualified teachers and low educational achievement. Spaull's research has found that learners attending fee-charging schools are two to four times more likely to qualify for university than learners attending no-fee schools. Around 15% of the nation's learners find themselves in tier one, with the remaining 85% in tier two. Access to either tier continues to be determined primarily by race and class, which is clearly incompatible with the constitutional obligation of substantive equality and redress for past racial discrimination. South Africa is one of very few countries in the world where primary and secondary education are not available free to all.